Not exactly wild, but these turtles are resident in the greenhouse pond in Hall Place, Bexley. I've seen them on the odd occasion swimming in the pond, but this was the first time I saw them basking and got a better look at them. Nobody knows how they got there, but its reasonable to assume they have been brought there by people who bought them as pets and when they got too big, they released them into this pond. Fortunately, they are well fed by the staff, so they don't bother the fish too much, although the odd one or two have been found with chunks bitten out of them. I'm not 100% sure, but the turtles basking on the side look very much like Yellow Belly Sliders and the one trying to get out to do a spot of basking is a Red Ear Slidder. Both species are from North America and are popular pets. 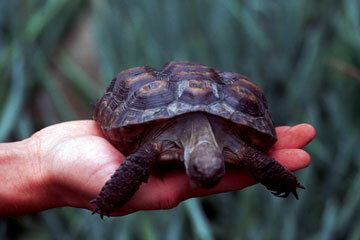 Many, along with the Box Turtles are captured from the wild and sold or exported by the pet trade. As these sliders can get quite big, they are often released into the wild when their owners find they do not have the space for the tank required. 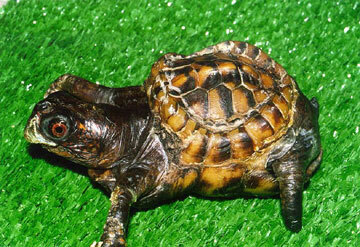 A turtle needs a 10 gallon per inch tank capacity, so a single Red Ear Slider adult may need a 150 gallon tank. Release of these turtles into the wild can result in the demise of the turtle or devastation of other wildlife in the locality and is illegal. In the words of John Cleese, and now for something completely different. As part of their pre hibernation check up, my two Mediterranean Spur Thigh Tortoises (Testudo Graeca Graeca) were Xray'ed, so I thought you might find these pics a little different to the usual. Don - great pics. Hope the strange build-up/brightness on the centre left (as we see it) of the top picture is nothing to worry about - it looks anomalous compared to the rest of the two pictures, its so solid I wonder if it is shell injury(?) that has scarred or the like. Your assumption is spot on imatfaal. Or at least, I believe so. I am waiting for a response to my query on the matter from our vet. Although they have checkup's before and after hibernation each year, this is the first time I have had them X-rayed. We gave these two a new home after their original owner (a neighbour) decided they were taking up too much space, time and pennies. I do wish people would think ahead before committing themselves to pets, especially exotic pets. While roaming the kitchen floor (owner's 2nd mistake; dangerous for the tortoise and for humans, since tortoises can carry salmonella and/or have worms or other parasites. I hasten to add these two are in the best of health) they had access to the owner's dog and cat food. (3rd mistake; animal protein can(and did)cause pyramiding of the scutes. It can also cause other bone problems and can kill). Unfortunately Mr Pastry (the other one we named Pork Pie) was an object of great curiosity to one of the 3 dogs and was picked up by her. Although the injury was slight, it did leave a scar on the shell's surface and some internal damage. The vet who tended to her deemed the internal shell damage was no so great as to warrant any action and that Mr Pastry would be better off left to recover naturally. 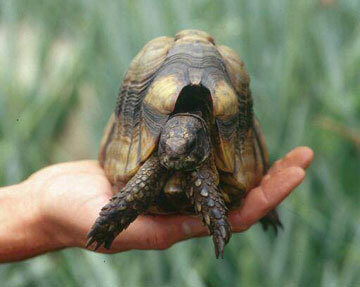 Obviously, any invasive operation on a tortoise's body under the shell involves cutting into the shell. Not a procedure any herp vet would undertake unless absolutely essential. The external scar (6 years on) is now almost undetectable and Mr Pastry has suffered no ill effects from the broken pieces under the shell. Unfortunately, pyramiding of the scutes caused by eating dog food and other incorrect foods (such as Brasicas) is not reversable, but it has not got worse. A California Dessert Tortoise raised on a high protein diet. 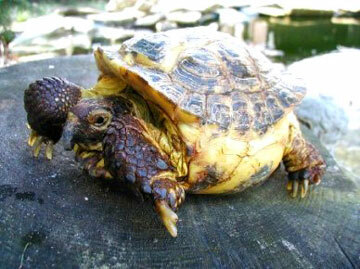 A Marginated Tortoise also raised on a high protein and low calcium diet. This poor Box Turtle, though omnivorous, was raised on dog food alone. 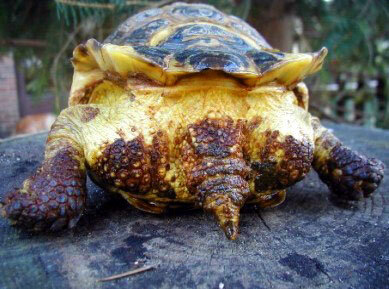 Perhaps most disturbing, this Horsfield Tortoise was raised in a vivarium on lettuce and fruit. Above pictures from the Tortoise Trust. You can look at the local vervets, they are having a very fecund year, with a dozen or more babies, and a whole lot of adolescents around. Taken in the south of France. 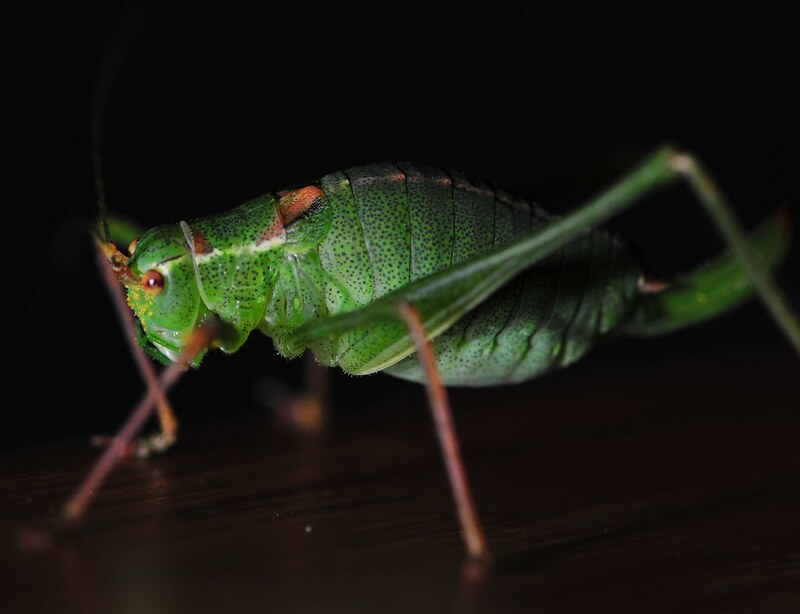 Please excuse the quality, this was rather a hasty shot, hand held with a Sigma 105mm macro lens. Here's something I recall seeing often when I was mere lad in short trousers. I haven't seen one for years. I had to go like a mad thing to get my equipment out & set up for this shot. I'd quite forgotten how fast a caterpillar can move. This is a mug shot of one of the pesky little varmints that have been making a meal out of the clematis. *note if you need/compulsory/unshakable-belief/require "cheap" and "effective" : This camera (Nikon Coolpix L340) did well at depth of field in Macro and it's cheap, the video here is at basically max depth. Only this video and the 21MP picture are from this camera. It's difficult to find a camera that does well at macro and on Auto functions! The above two photos are around medium tele-macro , the next two are an "avarice" and "greedy" to gather such a small quantity. A large part of the technique is holding still with 2 or 3 hundred stingers ready and at a distance of around 2 inches from the lens. Movement shake is the biggest problem and getting the field depth for tele right. I have used many cameras and the 8MP was better than a top brand but essentially useless because of battery complications, so i got this one and its delivered the pics. Drones everywhere on the origin wild hive entrance. Wild hive entrance - these wild hive pics were taken after a week of cold weather, it had been the second day since the cold it had reached near 30 degrees Celsius and there had been swarm behavior. It has been well over 16 days (swarm cell gestation period) since the last swarming occurred(when i scraped them into a box off the wall and put them in the Langstroth 10) on the first hot day of spring that was over 30C, it was actually 37.4C degrees Celsius around October the 5th when they were boxed. Feral-bees in a swarm trap hive and forage can be seen under the frame top by translucency through the frame wax foundation sheet. Feral Bees Being Fed on the landing board of the Swarm trap hive (1). (8MP) Feral Bees Being Fed on the landing board of the Swarm trap hive (2). Taken at Knole Park, Sevenoaks. Suppose i shouldn't feed these any more soft drink after McDonals. European wasps killing bees in my apiary, probably the ones that slept on me in winter. I have not seen such a picture! What is that? 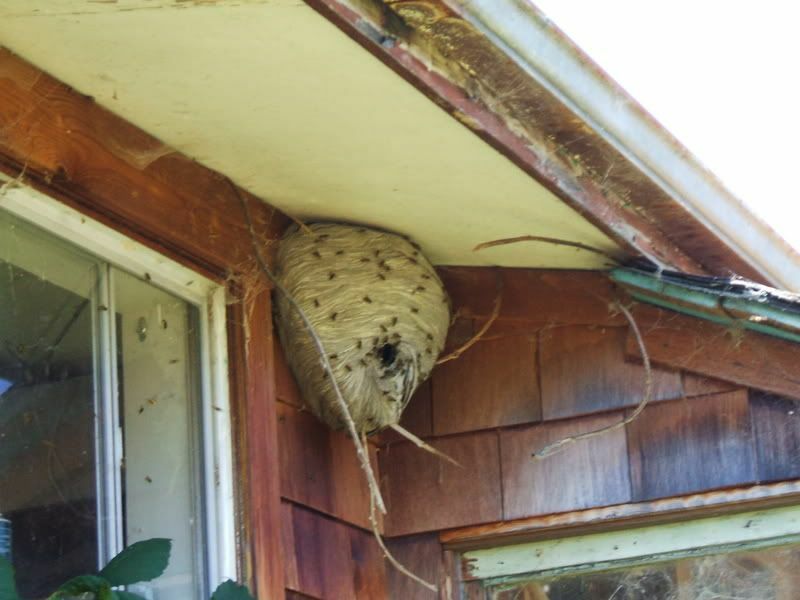 I can see some nest but I am not sure what it is. Page created in 0.172 seconds with 77 queries.